The basic idea of AI Foom or Hard Takeoff is that, sometime in the future, an advanced AGI may go from relatively innocuous subhuman-level intelligence all the way up to superhuman intelligence, superintelligence, in 5 minutes or some other remarkably short period of time….. By rewriting its code over and over (each time learning better how to rewrite its code), or assimilating additional hardware into its infrastructure, or whatever…. 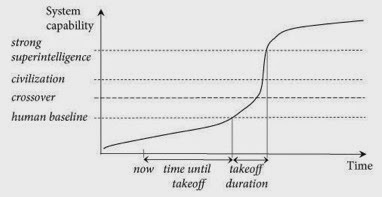 A Hard Takeoff is a special case of the general notion of an Intelligence Explosion — a process via which AGI gets smarter and smarter via improving itself, and thus getting better and better and faster and faster at making itself smarter and smarter. A Hard Takeoff is, basically, a really really fast Intelligence Explosion! Richard Loosemore and I have argued that an Intelligence Explosion is probable. But this doesn’t mean a Hard Takeoff is probable. In spite of being a huge optimist about the power and future of AGI, I actually tend to agree with the anti-Foom arguments. A hard AGI takeoff in 5 minutes seems pretty unlikely to me. What I think is far more likely is an Intelligence Explosion manifested as a “semi-hard takeoff” — where an AGI takes a few years to get from slightly subhuman level general intelligence to massively superhuman intelligence, and involved various human beings, systems and institutions in the process. A tasty semihard cheese — appropriate snack food for those living through the semihard takeoff to come. 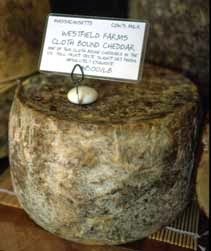 Semihard cheeses are generally good for melting; and are sometimes said to have the greatest complexity and balance. Human society is complex and disorganized enough, and human motivations are complex and confused enough, and human judgment is erratic enough, that there would be plenty of opportunities for an early-stage AGI agent to embed itself in human society in such a way as to foster the simultaneous growth of its power and intelligence over a period of a few years. In fact an early-stage AGI probably won’t even need to TRY for this to happen — once early-stage AGI systems can do really useful stuff, various governments, companies and other organizations will push pretty hard to use these systems as thoroughly as they can, because of the economic efficiency and scientific and media status this will bring. Azerbaijan’s leaders get bought off by a wildly successful AGI futures trader, and the nation becomes an AGI stronghold, complete with a nuclear arsenal and what-not (maybe the AGI has helped the country design and build nukes, or maybe it didn’t need the AGI for that…). The nation the AGI has bought is not aggressive, not attacking anyone — it’s just sitting there using tech to raise itself out of poverty … doing profitable deals on the financial markets, making and selling software products/services, patenting inventions, … and creating a military apparatus for self-defense, like basically every other country. So how could we stop a semihard takeoff from happening? We can’t really — not without some sort of 1984++ style fascist anti-AI world dictatorship, or a war destroying modern society projecting us back before the information age. And anyway, I am not in favor of throttling AGI development personally; I doubt the hypothetical Azerbaijanian AGI would particularly want to annihilate humanity and I suspect transhuman AGIs will do more good than harm, on average over all possible worlds…. I’m not at all sure that “an AGI taking over the world” — with the fully or partly witting support of some group(s) of humans — would be a bad thing, compared to other viable alternatives for humanity’s future…. The point is, there is a clear and known risk of early-stage AGIs being manipulated by humans with nasty or selfish motives, because many humans are known to have nasty or selfish motives. Whereas the propensity of advanced AGIs to annihilate lesser sentiences, remains a wild speculation (and one that I don’t really find all that credible)….. I would personally trust a well-designed, self-improving AGI more than a national government that’s in possession of the world’s smartest near-human-level AGI; AGIs are somewhat of a wild card but can at least be designed with initially beneficent motivational systems, whereas national governments are known to generally be self-serving and prone to various sorts of faulty judgments…. This leads on to the notion of the AI Nanny, which I’ve written about before. But my point here isn’t to argue the desirability or otherwise of the AI Nanny — just to point out the kind of “semihard takeoff” that I think is actually plausible. IMO what we’re likely to see is not a FOOM exactly, but still, a lot faster than AI skeptics would want to accept…. A Semihard Takeoff. Which is still risky in various ways, but in many ways more exciting than a true Hard Takeoff — because it will happen slowly enough for us to watch and feel it happen….